Make your way to the self-check-in counter. Go for your credit card, the one you purchased this ticket with, and pause when you realize it isn’t there. Michelle. Come on. You’re about to board a plane for the longest vacation you’ve taken in two years, and you don’t have your favorite credit card (read: the one that works) on your person. Focus. One problem at a time. (This is a good strategy for you; use this more in the future). Remember the technology machine you pay to carry around in your pocket. Remember email. Remember something called a confirmation number. Ask about the boarding pass that didn’t print. Nod when the Delta Counter Lady says, oh they’ll give you one in Atlanta, even though you’ve flown enough to know this isn’t how it works. Make it through security amid nervous first flyers and the Amish. Think about the Amish. You don’t know much about them. You should Google that. Them. Purchase a breakfast sandwich from the “healthy place” in terminal D. Take a bite of the breakfast sandwich. Throw away the breakfast sandwich. Resolve to pack your own airport snacks from here on out. Find your credit card in your jacket pocket. Rejoice! You found it. Resolve to stop keeping credit cards in your pocket. Resolve to write down some of these resolutions for the new year. Resolve to write more. Receive a text from Delta that your flight has been canceled, but not to worry, they’ve scheduled you for a flight tomorrow morning. It’s not your first flight that’s canceled, not this one that you’re waiting for. It’s the next flight. Your connecting flight. The on you’re supposed to catch in Atlanta, two hours from now. And it’s canceled? Not delayed, but completely canceled? You’ve never had a completely canceled flight before. How exciting! Something new. You’re always saying how you’d like to try new things. Counter Delta Guy calls your name. He hands you a new seat assignment for this flight. Window seat. Cool. But listen, you say. Do I talk to you about Atlanta, or someone else? My flight was canceled; they re-booked me for tomorrow morning. That’s terrible! he says, both hands now on his keyboard, typing savagely like it’s 1995. You finally agree on this option: you’re on standby for the 12:30pm, but you’re definitely on the 7:30pm. And the 7:30pm is guaranteed, right? That doesn’t mean a whole lot since my “guaranteed one” from this morning was canceled. He pretends not to hear you, lost in his typing again. And here are two meal vouchers. Merry Christmas! Board plane. Fall asleep immediately. Atlanta. Go to gate to “check in” for stand by. No one’s there because that flight doesn’t take off for 3 hours. Go to restaurant bar, use the free internet, and write about your stark hair. Use both vouchers because, as it turns out, airports are extremely overpriced, and you can’t get change from Monopoly Money. It’s an all or nothing kind of deal. Go back to your gate. Gate change. Find new gate. Join the outraged people from the previous flight because they’ve closed the gate prematurely and 15 people aren’t being allowed to get on the Norfolk, VA flight. The Delta Counter Lady starts screaming that Norfolk is gone! That plane is gone! forgetting that airports have windows and we can all still see the plane and the pilots laughing about some joke they’re telling in the cockpit. Watch as the people win, and the Norfolk folk are allowed to board the plane. Cheer. Because it’s that kind of day. Try to talk the same Delta Counter Lady into letting you onto the 12:30 flight. Where are you on the standby list, exactly? you want to know. You’re third, she says sweetly, and there are three spots…so your odds look good. Get comfortable, dude. She’s lying. You are third, but there are only two spots. Your name never gets moved to the cleared list. Watch a flight for your destination take off. Get in line with the other standby hopefuls to ask what’s next? A new Delta Counter Lady says that you’ve all been put on the standby list for the 4:30 flight at another gate. 4:30pm flight? How is this the first time you’re hearing about a 4:30pm flight? Just use your current seat request for that flight. Go to the new gate with your new friends. You can’t check in for another two hours, because that flight isn’t taking off for another four. Find another bar. This one has Saints’ fans. Say Who Dat and drink a terrible margarita (that does get better the further in you go). Write some more. New gate has a different destination listed. So you ask. And the Delta Counter Lady says yes, it is going to your destination, like you’re the one that’s crazy. You point to the sign to explain your confusion but she doesn’t look behind her. How can I help you? she prompts. Hand your seat request from the first flight to this new Delta Counter Lady as you were instructed by the other Delta Counter Lady. This flight took off four hours ago! You aren’t on standby for this flight! This is an old seat request! Be calm. Be calm. Be calm. Deep breath. Be calm. Explain that yes, she is correct. This is from a flight that you missed four hours ago, but That Counter Lady told you that you’d be automatically added to the next flight’s standby list. This woman starts typing. Sighing and muttering under her breath. Well you’re not on the list! Another Delta Counter Lady steps in and whispers loudly, just put her on the list. It’s fine. Just add her and print a new seat request. Ah. You were wondering when logic would make its appearance. This flight is delayed. Get comfortable. Oh, and you’re fifth on the standby list for a full flight. Still like trying new things? Everyone has boarded. They call the names of two other standby friends. And then they call your name. Well, do you want to get on this flight? the Delta Counter Lady asks, referring to your slow moving pace and confused face. You’re on a plane! Halleluiah. Go to sleep again instead of working on your thesis or reading one of the twelve books you packed. Arrive at your final destination. Approach the baggage carousel, but know as you do, that your bag won’t be there. I mean, come on. Who do you think you are? You practically ran onto that plane as it was pushing off from the gate. Clearly, your bag is lost and drunk in Atlanta, riding around and around one of their carousels with the international luggage. A family gathers around you: they’ve circled you on all sides, discussing whether this black suitcase is their black suitcase or someone else’s black suitcase. Three more family members join the conversation. What does the tag say? I don’t see a tag. Did yours have a tag? I don’t remember. Then, “someone else” walks up because they also have a black bag. And it really looks like this black bag. You update your sister and she says no matter how our species evolves, people may never be able to properly identify their luggage. And that’s sad. You think she’s said something quite profound. Then the carousel stops moving, and you notice you’re the only one still waiting. That’s sadder. You’re in what people call a “tiny airport,” so there isn’t a “baggage office” per se. You get in the check-in line for Delta, bracing yourself for the 8th Delta employee you’ve interacted with today as the line dwindles. Finally it’s just you and the woman in front of you. Me again she says, slapping her boarding pass on the Delta counter. Oh no. This is a bad sign. You’re too tired to properly eavesdrop, but the gist of it is that they cannot exchange her tickets because she purchased them through a third party. Ugh. Been there! But focus, cause right now you’re here. Another Delta Counter Lady recognizes your long-drawn-out-look-at-me-I’m-so-tired sigh, and she asks how she can help you. I just got off a plane from Atlanta, you say, but my luggage did not. She scans the UPC code you saved in your wallet from this morning, and you wonder what would have happened if you lost that small piece of paper. Way to hold on to things, Junot! There’s a lot of typing, even though she’s just scanned the bar code. She gasps suddenly, and looks up at you with what seems to be genuine horror. It looks like your bag is still in Atlanta! she says. Without any facial expression or change in your tone, you say that is shocking. She looks down, unimpressed with your attitude. Um…what? You’re tired, so you think you misheard her. Your luggage. Can you describe it? Pause. Or “time out” like Zac Morris. You’re tempted to just completely freak out here! She just told you where the bag is, and now she’s asking you to describe your luggage like you’d ask someone to describe lost keys they’re trying to claim, or a child, or a puppy maybe? Um…okay…it’s black. You think of the family by the carousel. Work harder. She points to ten bags with wheels behind her. Is it an upright like one of those? she says in a voice used to speak to children and the elderly. Oh good. She thinks you’re dumb. No…no not like that. A rolling duffel? Is that a thing? Because if that’s a thing, that’s what it is. Oh gosh. She’s speaking to you that way because you sound completely stupid! Use your words! Yes, yes ma’am that’s a thing. Do you remember what brand it is? No one knows what brand their suitcase is unless it’s something outrageously expensive! Um no. I mean…it’s nothing fancy. She looks at you with sad eyes and says, Oh honey, that’s okay! You call your sister for her address because you’re too tired to remember it on your own and they need a location to send the bag when it arrives. Upon answering the phone, your sister says, Just leave it! I mean really, just leave the luggage. We can buy all new stuff. You fight hysterical laughter because the Delta Counter Lady is saying something like or, if it’s easier, you can come back and pick it up. You give her the address, she gives you another bar code, and you walk toward your sister’s well organized glove box. Translation: It doesn’t matter how old your are; the Atlanta airport kills souls. You will always have a story when traveling. Always. But listen. Make use of it. Write it down. Make another ebook if you need to, but pay attention. Because the inconvenience is not the whole story. You forgot about the rainbow. You forgot to say that on that very first flight this morning, the one you always book so early so you can see the sunrise, the one from Baltimore to Atlanta, you saw a rainbow. Before you fell asleep, you saw a freaking rainbow from the sky. You pressed your forehead to the cold glass, and smiled like a child would because you saw a rainbow—the entire arc of it—from the sky! Beautiful! You pointed it out to the woman sitting next to you and she grinned, too. Neither of you moved for a camera, for fear that you’d miss the realness of it if you tried to preserve it longer than this moment. You lived in it for just a few minutes together, grinning, each remembering memories the other didn’t know. For you, this rainbow reminded you of another. 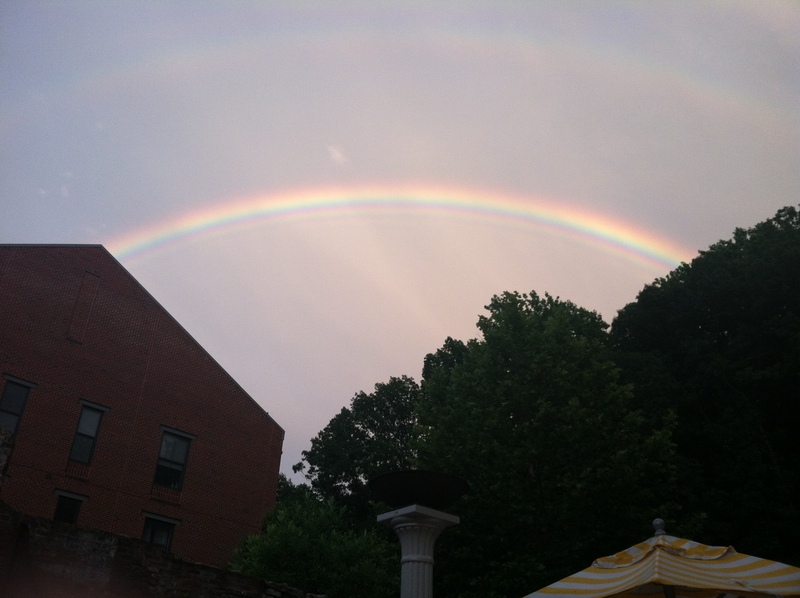 Six months ago, a rainbow broke through the sky above your apartment right before everything changed. You photographed it from the pool where you read alone, trying to figure out this thing you call life. You were once taught that rainbows are a reminder of a promise of love after the storm, but in your own experience, they come just before. They serve as a lasting reminder to hope for more. They get you through the hard days. They say hey! enjoy this, because you’re about to struggle. But hold on. Because it won’t be like this forever. Time always passes. Planes land. And your luggage always finds its way back to you, rips and all. Oh, planes. My friend and I once showed up in Philly for a short flight to Newark only to find out that the flight had been deleted – not cancelled – deleted. We had booked it three months prior and they stopped running that particular flight. The problem, however, is that we only needed to catch that short little flight to Newark because our flight to Glasgow, Scotland – on the other side of a very large pond – left from there. This story actually needs to be told in something other than a comment section of a friend’s blog post. So for now, you’re being cliffhung.